Taking care of your senior loved one may be one of your duties as a family caregiver, but you also need to take care of yourself. Just like you need to get plenty of rest, you also need to exercise. Working out and participating in physical activities could boost your mood, give you more energy, and prevent you from getting ill. Here are some exercises family caregivers should add to their weekly routine. Exercising doesn’t need to be complicated. Take a quick walk through the park or jog around the neighborhood. Walking can enhance your mood and increase your bone strength. It may be difficult to cook healthy meals, since most of your free time is limited, which makes it extremely important to work out to maintain a healthy weight. The more frequently you walk, the more health benefits you can receive. Hiring a professional home care agency is one of the best ways to take a break from your caregiving duties to relax and exercise. Families who need help caring for a senior loved one can turn to Home Care Assistance, a leading provider of Sacramento home care. Services available in our customizable care plans include meal prep, mental and social stimulation, assistance with personal hygiene tasks, and much more. Many family caregivers experience stress for a variety of reasons. You may stress over your loved one’s current medical condition or because of the overwhelming caregiving duties. Regardless of what is causing stress, it is important to find ways to combat it, such as yoga. Yoga is a form of exercise that relaxes the mind and allows you to practice different breathing techniques that soothe the body. If you have to help your loved one move from room to room, do exercises that can strengthen your muscles, increase your balance and flexibility, and help you control your weight. Strength training exercises can strengthen your bones while making you feel better emotionally. The best strength training exercises to do are jumping jacks, planking, push-ups, and bodyweight squats. Doing these exercises can enhance your muscular fitness and make it easier to assist your loved one with walking around the home and when lifting him or her in and out of the bed or tub. If you are the primary family caregiver for an elderly loved one and need additional assistance providing high-quality senior care, Sacramento Home Care Assistance can help. We are a leading home care agency committed to changing the way seniors age. Family caregivers are at a higher risk of developing hypertension, diabetes, and high cholesterol levels, which is due to the daily stressors they experience. 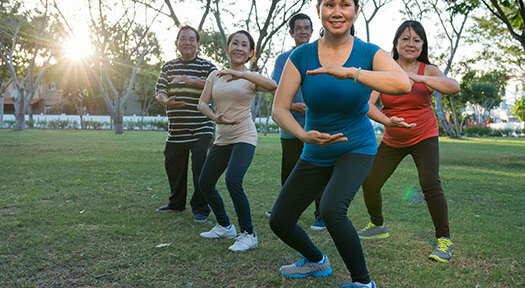 The negative behavioral and psychological effects of caregiving can cause spikes in blood pressure levels, but doing aerobics can bring those numbers down. Dancing, swimming, running, and using cardio machines can help you lower your blood pressure levels and protect your heart health. Pilates is an exercise that can help caregivers reduce the risk of injuring themselves while caring for an elderly loved one. The techniques done in Pilates can help you maintain a body with balanced strength and flexibility, which is necessary when caring for a senior with mobility issues, joint pain, or poor muscle strength. Family caregivers are prone to accidents when lifting an elderly loved one, but Pilates elongates the muscles and increases joint mobility. Hiring professional caregivers is one of the best ways family members can delegate caregiving duties to others so they have time to engage in exercises. Sacramento respite care professionals can assist seniors with a wide array of daily tasks, offering family caregivers the chance to focus on other personal responsibilities or take a break to prevent burnout. Whether it’s for a few hours a day or a few days a week, respite care is the perfect solution for family caregivers who are feeling overwhelmed. To create a customized in-home care plan for your loved one, give Home Care Assistance a call at 916.706.0169 today.